Vauxhall Meriva exclusive preview | What Car? Could Vauxhall's new Meriva be the most family-friendly MPV ever made? We're looking for six readers to tell us what they think, at an exclusive private preview. • a few lines on why you're interested in seeing the new Vauxhall Meriva. The exclusive preview will take place on Monday, March 22 from 4-6pm at What Car? 's HQ in Teddington, Middlesex. The new Meriva boasts a flexible cabin layout, rear-hinged doors for ultra-easy access, a standard kit list which includes a CD player, electric windows and heated door mirrors, and a storage rail running the length of the cabin. There's a choice of three petrol engines and two diesels for the car which costs from 15,495. Your comments and photographs will appear in the June issue of What Car? magazine's Reader Test Team feature; you'll also be asked to speak on camera for footage to be broadcast on whatcar.com. Six readers will be invited to attend we'll get in touch on Monday, March 15 if you've been successful, with further details of the event. 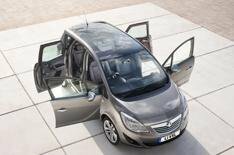 Click on the links below to find out more about the Vauxhall Meriva and see other new car previews.